In 2015 Buhari signed Paris Climate deal; do you know what it means? It means that we cannot use our Coal in Enugu to power our energy; so Enugu coal is now useless. This deal is for us to be using solar which cannot give us the quality of electricity that can power us to develop our land and the solar will occupy our lands, making us to be poorer. This coal is what United States, India and rest of other countries used to develop. Did you see the budget of this year? They took our education, they took our Sea Port, they took our oil, they took our gas, they seized our goods, share it among themselves, sometimes they sale it. Check prize of air ticket from Enugu to any part of the world then check from Lagos to any part of the world and tell me what you see. They took our positions in the military, Police, Airforce, road safety, civil defense, Navy, every government positions. They took our jobs, introduced policies that made our businesses to crumble making us to believe in some pastors who lied and keep lying to us that our brother or sister is bewitching us. But we don't know that the monetary policy of government can crumble any business, raising the prize of dollar to syphon the money of business men and women into their pockets. They took our resources and made a law that makes it impossible for us to build our roads. They kill our young youths in a little provocations, millions of our people have died and thousands are still dying. They chased out our mothers and fathers in their farms by rapping and killing them in the name of Fulani killer herdsmen and shut down all our access to work. How do we survive? They gave us quits notice, they killed our boys in all oil producing region. They killed John Togo, Tompolo's father and took away our holy staff which they later returned by forces unseen, they called/calls our Ijaw youths 'militants' because of our God-given blessings. They annihilated the whole Odi Community and nobody raised an eyebrow. They wiped off more than 600 people, razed villages and raped girls and women in Agatu, Benue State and Nimbo, Enugwu State respectively. Our political leaders were used to enslave their own people who just came out from civil war of good three years with starvation, giving us coins during election period because they know that we are hungry. Biafrans; it is high time we think. They said Nnamdi Kanu is arrogant and a fraudster but I asked my self why is it that no one both inside and outside Nigeria has indicted him with one corruption or the other. They beheaded our sister for preaching the gospel and paraded her head on TV yet their Court discharged and acquitted the killers. Our political leaders chose investment above our lives just the way Fulani killer herdsmen exchanged our lives with cow. We want total freedom. No more again. Nnamdi Kanu before I thought you are what they said but I have realized that those who hate you are those who brought our knees to the ground and messed our future up. In 1945, Northern Moslems killed hundreds of Igbo civilians in the Northern city of Jos and looted their properties worth hundreds of millions of dollars! Kano, thousands of Igbo men and women were killed and their properties worth hundreds of millions were looted! women of all ages, as well as children. shock at the pogrom unleashed against the Igbo, had concluded that Easterners/Igbo were not wanted in the Nigerian federation and had declared the Eastern Region, the independent Republic of Biafra. By the time the war ended in January 1970, more than 5 million people, including over a million children had died. Many of the dead, especially children, had died of starvation, a result of the deliberate policy of the Nigerian government, which had imposed a total land, sea and air blockade of Biafra; prohibiting even food and medical deliveries to the war zone! Since 1980 thousands of Igbos have continued to be attacked and massacred! In 1980 northern City of Kano! 1982 northern City of Maiduguri! 1984 Northern City of Yola! 1985 Northern City of Gombe! 1986 Northern Cities of Kaduna and Kafanchan! 1991 Northern Cities of Bauchi, Katsina and Kano! 1992 Northern City of Zango Kataf! 1993 Northern City of Funtua! 1994 Northern City of Kano! More than 3000 christians which included more than 2000 Igbos were slaughtered in cold blood by Northern moslem fanatics in the Northern City of Kaduna. In 2015, a total of 150 Indigenous People of Biafra were slaughtered by Boko-Haram who infiltrated Nigeria Army. From 2010 to 2017 more than 3000 men, women and children has been massacred and raped and buried alive by Federal Government Sponsored Fulani Terrorist herdsmen. Nnamdi Kanu, I believe you from now on. They said "Igbo enwe eze" but we will prove to them that Igbo nwere Eze, no matter what they do we stand with you. Now, we are formidable, Now we are passionate, Now we are fanatic about Biafra. BIAFRA IS HERE. 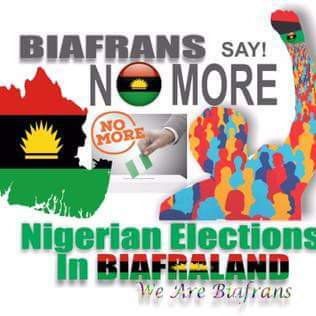 NO ELECTION IN BIAFRA LAND UNTIL A DATE FOR BIAFRA REFERENDUM IS GIVEN! Onuoha Endurance Ebelechukwu is a Political Scientist, Civil Rights Activist, Journalist and Public Speaker.